In 2009, my boys were grown up and gone and I was feeling like I had missed out not having a little girl. I went to an event for A Family For Every Child and saw some pictures of children who wanted mentors. There was a young girl who lived in my neighborhood with her foster family. I signed up right away. When I met Shelley, she was twelve years old and living in a foster home with three other girls. The four of them all shared a room. Shelley wanted to learn to ride a bike. I found out there were so many things she had never done. She had never made her own bed or prepared her own meals. She had rarely shopped to pick out her own clothes or eaten at a nice restaurant. School was hard for Shelley. In fact both social and academic skills were hard for Shelley. A lacked confidence often led to her sabotaging relationships with her peers. Shelley's reading and writing skills were significantly below grade level. I attended IEP meetings, listened to her teachers and helped her organize and complete requirements. In addition to her difficulties with school, Shelley was dealing with the trauma she suffered while in the care of her mother. She felt angry and betrayed. Many years of counseling have helped Shelley express her feelings and deal with her sad and scary memories. My time with Shelley has been fun. We eat many meals together. Some we prepare together and some we eat out. Shelley has spent some holidays with me. We shop and go to movies. When she was 13, I took her to swimming lessons because I think every child should learn to swim. We also rode horses, walked on the beach and played miniature golf. When she graduated from 8th grade, I was the only adult at that graduation for Shelley. We have had long conversations about how to deal with bullies and fickle girlfriends. Since I was a reading teacher, I always got books for Michelle and made sure she was always reading something. This June was one of the happiest days in her life- and mine. Shelley graduated from high school. She passed all state benchmark tests and almost exceeded the benchmark in reading. 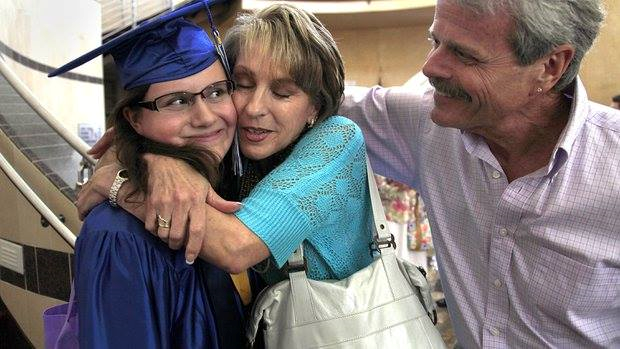 At the graduation, she had her boyfriend and his family, her biological sister and her biological father. Now Shelley is planning to get her CNA and go to Lane Community College in the fall. Being a mentor has been very rewarding and lots of fun. Shelley often thanks me and lately she told me that she would not have graduated if I was not in her life. My name is Jen and I began mentoring in January to a 15 year old girl. Before I met my mentee I was not looking to be a mentor. I was just looking to fill a few extra hours a week by volunteering and I knew that Lisa would place me where I would be the most help. So when her response was "how do you feel about mentoring" all that went through my head was are you kidding? I am pretty sure I started laughing. My hesitation was not because I didn't think that I would be a positive role model. I really didn't think that I had the personality for it as I am not very outgoing and I am some what quiet. Deciding to be a mentor was a huge step for me, one that I am so happy I chose to do it. When I started with the program I knew I wanted to give my mentee the feeling as if she was apart of our family, so a lot of our time spent together was at family outings, dinners, and birthdays. Things that she didn't always get to do because of being a foster child. The joy on her face made me understand why we need mentors for our foster youth. Today she is now my daughter. Our roles have changed dramatically over the summer. In June she needed to change placements. My husband and I were informed of this possibility from the beginning. It was a big decision and one that we knew the answer to immediately. If she was a fit for our family then there would be no way we could turn our backs on her. Our biological children bonded with her as well as our extended families. We couldn't imagine our family without her. I can honestly say it has not been easy. We have had our share of hiccups, but what families don't? I feel so blessed to have her in my life. She has taught me so much about myself. I am a better person because of her. I first met my mentee on July 1, 2008. Her DHS caseworker requested a mentor for her from AFFEC, and I was chosen to be matched with her. During the time since then, she and I have seen our relationship grow and change tremendously. From the beginning, we both have enjoyed shopping at Goodwill and at yard sales to find great bargains and hidden treasures. We also love to go out to eat dinner when we are together, to cook some favorite foods, to play board games and to shoot basketballs. It was a very special experience when she began to spend the night in my home every now and then, which gave us more time to plan arts and crafts projects to work on together. Recently, she spent several weeks living with me while her DHS caseworkers worked to identify a new foster placement where she and her younger brother can live together. This gave us a chance to really know one another well and to deepen our friendship as we shared our daily routines and talked about our hopes and dreams for her future. My mentee says that having a mentor is a lot like having a best friend, someone that you really trust. She thinks that having a mentor is important because many kids don't have a chance to make friends, and a mentor is like your own personal friend, so that you don't feel so lonely. I think that being a mentor has allowed me the opportunity to watch a very special child grow and discover her real self while facing adversity that would certainly discourage most people. My skills at listening and supporting her have been strengthened, and I have had the joy of knowing that I can make a difference in how her life unfolds. Both her and her brother are now in a wonderful new foster home, which happens to be much farther away from me, but we have decided that we want to continue our mentoring relationship because it is so important to both of us. In the next few weeks, we will start to see how things will change, since we will not be able to get together as frequently as before. Nevertheless, I believe that we will each make the effort to stay close friends, and that I will have the very special privilege of watching her grow into a beautiful, talented and successful young woman! My relationship with my mentor started during the end of January. It was about a week before my 15th birthday. We enjoy cooking together, going to church, and music. What I think that we've learned from each other is a lot. We have learned how to get along, treat each other with respect, and overall how to become more like friends. She has been a huge influence on me. By showing me that she cares about me, I now know what it is like to be loved by two parents, instead of just one. I love her and I hope that she stays in my life for many years to come. Even though we have a few arguments here and there, I know that she will always be there for me, and I will be there for her. She is a big part of my life now. I can't ignore the fact that she and her husband chose me. I have never felt so loved. When I sat in one of the visiting rooms at OCP, and my mentor and her husband told me together that they wanted me to live with them forever, I literally started to cry. It made me feel so good about myself, like I didn't have to hide a part of me anymore. I love the feeling that I get every time I look at my parents and they smile at me. I feel all warm and fuzzy inside my heart. They gave me the love that I had been craving my entire life. I feel as though I had had a tremendous hole in the middle of my heart. Now that hole is gone, thanks to the love and support that I get from my parents. To me a mentor is someone who looks after you when you're feeling down and out of sorts. They try to comfort you when you need it, and they are always there for you, no matter what happens. When you're feeling like there is nothing to live for, just ask your mentor how much you mean to them and then you'll wonder how you ever got to feeling so out of place. I think that mentoring programs are very important because it lifts the child's spirit every time you give them a smile. It makes them feel like they have a reason for living. For me, it's just the fact that I know that she's always there for me when I need her, and even when I'd rather be alone she is there. They're kind of like the best friend you've always wanted but could never find. When you find your mentor, make sure that they know that you love them and that you know that they love you as well. My mentor means everything to me. I can't live without her. I don't even remember what my life was like before I met her, it's just a fuzzy memory in the back of my mind. This is why I think that mentoring is important!! !